What will OTs get out of this course? 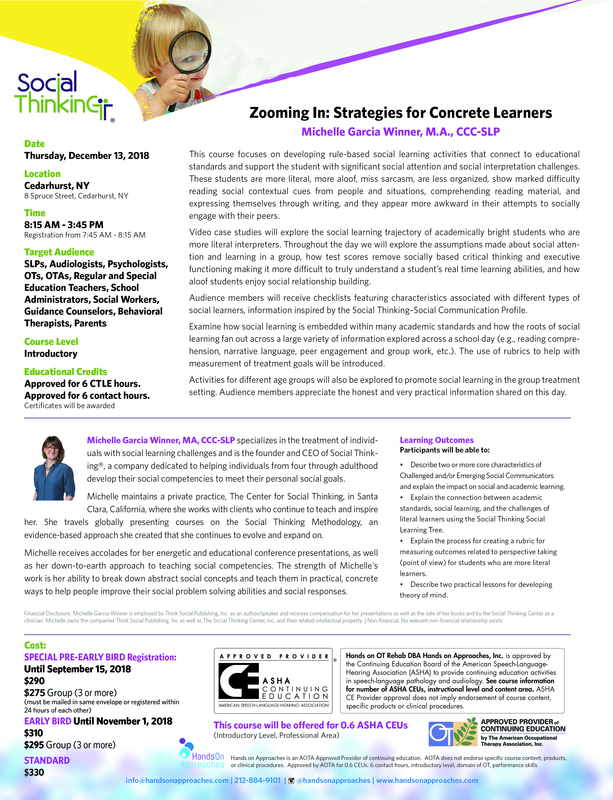 So we thought we’d share with you why WE are very excited to bring Michelle Garcia Winner in to present this brand new Social Thinking course. Ever work with children who over-generalize? The ones who refuse to go on your swing equipment because two years ago they fell off a swing at the playground and now all swings are bad? How about children who can’t generalize? As soon as a familiar activity changes even slightly, they need you to explain the instructions all over again… and again… and again. Social Thinking techniques give you the tools to get through to children who struggle with rigidity and black-and-white thinking. You’ll know what to say and how to say it to facilitate flexibility and cooperation, reducing frustration all around. Many children OTs work with have issues knowing where their bodies are in space, which translates into trouble picking up social cues. While you as an OT are working on the underlying physical issues that will eventually help the child act more appropriately socially, the physical regulation process is not always quick. Giving the child Social Thinking tools in the interim can be a social game-changer for her. As pediatric OTs, we often find ourselves in the position of hand-holder and guide for parents who feel overwhelmed with their child’s difficulties. The more resources we have for them, the more help we can provide. The Social Thinking tools are a practical problem-solving skill set, customizable to the needs and issues of each child. We’ve seen her speak at conferences that we traveled across the country for. She’s powerful, practical and personable. If you want to get a taste, check out this clip of Michelle at a conference where she called up a volunteer who happened to be on the autism spectrum.